A photo light box is a photography accessory made from semi-transparent materials that scatter the light coming from different sources of lights. It gives a shadow-less amount of light and hits against a solid and simple background. This is commonly used on photo advertisements of food or any smaller stuff fitted on the light boxes. If you are looking for the best photo light boxes, maybe our list will help you with that. Take a shot without any background shadows with this photo light boxes from TSLEEN. The box is very easy to set up, you only have to do some disassembly and movements to set it up properly. The brightness is adjustable depending on your need with the power control, now you can get the perfect bright for every shot. The tile shooting and overlooking shooting allows you to capture images in different angles, it helps you to get better shots. 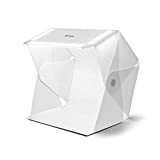 With a size of 16″ x 16″ x 16″, you can start the photo shoot anywhere since it does not take too much space and allows you to use it in different occasions. The 2400 lumens white light is mixed up with the silver interior of the tent to give perfect lighting. There is no need for you to purchase additional lighting since it is included in the package. If you are starting to advertise a product with the use of pictures and social media, well this can be a good investment. This photo light box from LimoStudio is a complete set of a small studio for your small stuff. 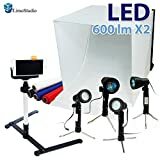 The 24″ cubic photo tent is where your studio where you will place your item model to capture and it includes 2 pieces of mini halogen light and 2 pieces of mini 5500K LED spotlight. You do not have to purchase separate lighting materials because it is included in the package. For your devices that you will use for capturing, it has a mini camera stand and a cell phone holding clip. This allows you to capture photos at a steady height. The photo light box has 4 color backdrops so you can choose which one will blend with your model, there is Black, Blue, White, and Red backdrops. The halogen light is 9.5″ tall, 12V and 50W, while the LED light is 9.5″ tall, 5500K, 600 lumens with the 120-degree beaming angle. 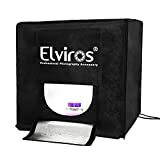 This 16″ x 16″ x 16″ portable photo light boxes from Elviros is very professional. It can shoot objects not bigger than 12″ x 12″ x 12″ and it has double 60 LED light bands with 13,000 lumens. The super bright light gives the perfect light source that every photographer needs. You can expect a pure white background since it is a lot brighter than the other tents. It has a multi-angle system that allows you to take photos in different ways you like. This tool allows you to take pictures with your different gadgets like DSLR, regular cameras, and even Smartphones. You are also allowed to bring it anywhere since it is handy. For installation, you do not need any tools; you only need your bare hands and some guidelines on how to assemble it. Since it is only small, you can place it anywhere you want and start the photoshoot right there. The package comes with a carrying bag for easy traveling, and 2 background paper boards black and white, which are both wrinkle and water resistant. This photo light box from Travor is a huge help for online sellers, photographers, and shutterbugs out there. 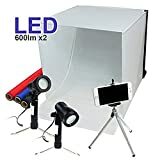 It actually meets the needs of everyone who needs some night photos of items; it will look like a real professional photographer took it in a real studio. When it comes to installation, this item does not need any complicated installation, you can assemble it in a few minutes and you are good to go. It has LEDs that gives different color temperature according to the need of your different products. It supports 4 backdrops that are replaceable for your different shooting scene. It is suitable for items from small and medium-sized products like jewelry, watches, food, glasses, and many more. The package includes two LED ring light with a solid tripod with 1800 lumens. It is adjustable to 180 degrees and gives light without dissolving a lot of heat. Since it is portable and easy to carry, you can place and use it anytime and anywhere. The photo light box from ESDDI is larger compared to the other light boxes that we feature, it is a 20″ x 20″ photo light box with 120 LED lamps with adjustable brightness. You can change the light according to its requirement using the knob. It has a 5500K color temperature and 26100 lumens to satisfy you and meet the photo shoot requirement. You can assure that the LED light is not flickering and steady to avoid color distortion and ensure a high-quality picture. This is very easy to assemble and use, you can carry it whenever you want since it has a storage box for you to carry it, and it has no tubes, glue, rod, connectors, and anything that will make the installation complicated. This has a multiple opening and closing way, and this allows you to choose which side of the box is your shooting position, a great way to find the right angle. 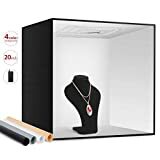 There is an aluminum shell inside of the box good for dissipating the heat and prolong the life of the photo light box, and a 4 PVC backgrounds to set your studio scene depending on your requirement. 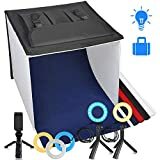 This portable photo light box is one of the best light boxes in the market. It helps you to provide good quality photos that you can upload on your social media accounts and online stores that can be used as an advertisement. This is an all in one photo studio for smaller products. Larger compared to other photo light boxes because it has 24″ extensive seamless background that gives seamless and soft background for your photos. The 5000K color daylight lighting assures you the right color for your subject. You do not have to get additional lightning or flash because the lighting included is enough. If you want a colored background to spruce up the photo shoot, you can purchase them with additional cost. This device uses 110/120V, and a converter required for 220/240V. When it comes to elegance, Foldio 3 has something to say. It has a unique and portable design that everyone will love. It allows the tent to be folded down with a thickness of 1″ and can carry it conveniently with its handle. This allows you to carry your own studio whenever and wherever you want. The magnetic structure allows the user to assemble this light box within 10 seconds and create a sturdy shape of light box. To have a clear black background without any reflection, you only need to attach the backdrop at the bottom of the tent and unroll it up to the top to fix it. It features a built-in triple LED diffuser with LED applied on the top of the studio; this is to lessen the shadows of the objects. You can control the lights of the Foldio 3 with the dimming controller. You can get multiple angles by simply folding the studio since Foldio means Foldable Studio. Our entry from the AmazonBasics is no wonder one of the best photo light boxes. There is no complicated assembly and installation required, you can set-up the studio within a minute and can collapse it into a thin, durable and portable case that you can bring everywhere. With a product dimension of 25” x 30” x 25”, larger compared to the others. The package includes a manual, power supply, and pre-installed and removable white backdrop. The built-in LED lights are for photography that uses a professional camera, regular cameras, and Smartphone. All the lights are properly positioned for contrast that gives 5600K daylight LEDs with CRI for color consistency. The extra light gives a direct light modeling just like in a photo studio. There is a 3 front door system to give you different angles and a top hole for taking photos at the top. Although it is larger compared to the photo light box, it is easy to carry whenever you need since it comes with a carrying bag. After using, you can store it even in a compacted place since it is collapsible. 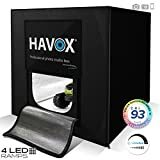 This photo light box from HAVOX has 336 dimmable SMD LED lights that give the perfect lighting that produces vibrant and bright colors. The LED features a color temperature of 5500K with 26,000 lumens and a CRI of 93+. This can help the products to look more professional since it has a higher quality than the other photo studios. It has different openings in front and at the top to allow you to get the right angle based on the object’s requirement. There is no need for you to worry about the reflections with shiny objects because it features a light diffusing fabric to eliminate the reflections and uniform the lighting. In the package, it includes soft plastic background shades that allow you to choose which background is suitable for your objects. The studio is perfect for people who take pictures of commercial purposes, you can now achieve the professional result wherever you need it. You do not need to be a professional photographer to get the best quality, all you need is a good camera and you fine. The assembly will not take too long since you do not need tools for it, and if you want to carry it for traveling, the carrying bag makes it easier for you. Our best photo light boxes are from LimoStudio. It has 4 different backgrounds so you can choose which one is perfect for your item. The tent is made from 100% Polyester and has an LED light stand with 5500K, 600 Lumen and 120 degrees. If you have a small space, this one is perfect since it is only 16″, and you can place it in compacted areas. 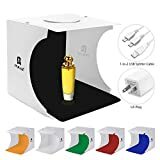 The package includes a mini tripod stand for your Smartphone and DSLR, the photo light box, 2 pieces of LED light and a clip holder for your phone. The tent helps to make a neutral and soft light and minimize contrast between the shades. This will help you to achieve the professional photos that you need for advertisement, social media, and online shops. Having a photo light box will help you to get the perfect photo for your blogs, online shop, and advertising related works. It is a good investment since you do not have to do some DIY that takes time, and the fact that you can bring these anytime and anywhere you want. Finding the right photo light boxes is hard, that is why we listed the best photo light boxes to help you with your problem.